Bring all new flavors to your specialty drink menu with this Torani sugar free salted caramel flavoring syrup! It's sweetened with Splenda brand sweetener, which offers the taste of real sugar without the calories. This tempting flavor will complement your beverages without overpowering them or being too sweet, while the user-friendly bottle will be convenient for your busy baristas to use. Torani flavoring syrups are specially formulated to resist curdling in milk and to hold up well under heat, making them the perfect choice for espresso-based drinks, brewed coffee or tea, and more. Use this flavor for frappes, iced coffees, smoothies, and even baking! 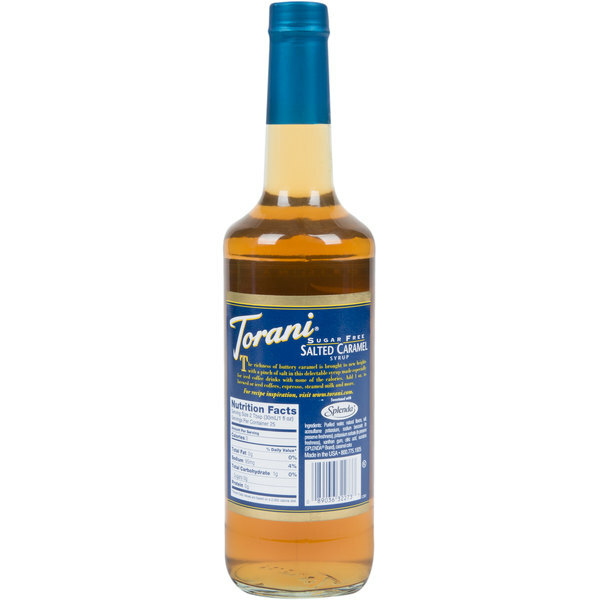 Torani sugar free salted caramel flavoring syrup brings salty flavor and the sweet smoothness of caramel together in one bottle. Discover new Torani recipes for this flavoring syrup, including iced sugar free salted caramel latte, salted caramel peanut butter sundae with banana, salty nut skinny latte, and more! Pour ingredients over ice and blend until smooth. Salted Caramel in general is a delicious flavor! With the sugar free, it tastes the same. You cannot taste that it has no sugar... great buy!!! This is one of my flavorite sugar free syrups. It has a more dynamic flavor than regular caramel syrups and isn’t overly sweet. I add it to iced coffee and it results in a smooth, rich flavor. What's better than hot cocoa on a cold day? Hot cocoa with a splash of Torani Sugar Free Salted Caramel Flavoring! YUM! Such a flavorful addition! Who needs an expensive drink from a coffee house when you can make your own at home using this great syrup! Ok on another review for torani sugar free syrup i stated i could drink it from the bottle. I am not too ashamed to admit I have drank this straight. This sugar free caramel syrup is my liquid heaven. I put it on everything. I mean Everything. Drinks, cookies, cakes, frosting, straight, ice cream, cheesecake...oh my this stuff is the nectar from heaven! Most popular Suagr Free syrup we use. Can't even tell it's sugar free. Flavor is on point. Really helps us create great tasting drinks! So good! This flavor is our most used flavor. We use it as it comes from the bottle as well as mixing it with chocolate. Great in dark roast coffee. Great price and great product. We use this in our break room at the corporate office. It has a great flavor and is one of our favorites. This syrup tastes like a regular salted caramel syrup. Not noticeably sugar free. Not overly salty. It is a little artificial tasting. I've bought this when I can't find other brands. I like to order the sugar free syrups to add to my coffee or hot chocolate. 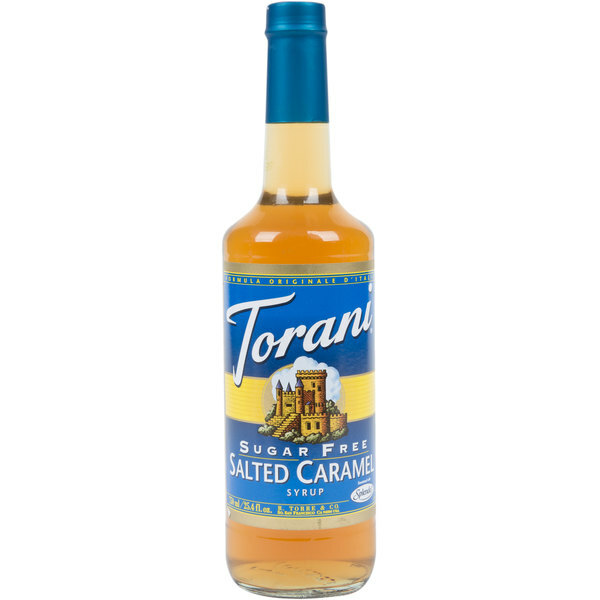 I find the Torani syrups in general to be pretty good and this salted caramel flavor is delicious!! An absolute favorite. Love it! It does have a little bit of that after taste because of the artificial flavoring but all my customers love it and haven't complained!! BY FAR MY FAVORITE!! The sugar free salted caramel flavoring syrup is delicious and very bold. A great tasting syrup and can not believe there is no sugar. A great coffee syrup. This is what we use to create our ever-popular sugar-free salted caramel lattes! Our customers love it because it doesn't taste artificial in any way. I really like the selection of flavors available here. It's the best that I've found anywhere. I had been ordering from Amazon, but was only able to get the same 6 flavors and the price kept going up or it wasn't available. Your prices are comparable, the ability to choose my flavors is fantastic, and the shipping was quick and my bottles were well protected. oh my good! we love this salted caramel syrup!! what a great choice for sugar free!!! you wont go wrong with this syrup. good flavoring and good price! Customers who have a sugar free diet often ask for salted caramel drinks and now we can offer it. There is basically no difference in taste compared to the regular version. I have coffee with the girls every Wednesday morning, and we are watching our sugar. I bought this sugar free slated caramel syrup and surprised them. They were thrilled with the taste, and so was I. It was so rich and decadent and no sugar. A great find for us. Bought it on a whim for our hard working employees. Big mistake! They loved it so much we have to keep it on hand or the staff gets grumbly. It is very difficult to find salted caramel flavor for coffee that is sugar free. Now that I've found it, I'll be drinking a lot more coffee. Also looking forward to using it as an ice cream topping! !